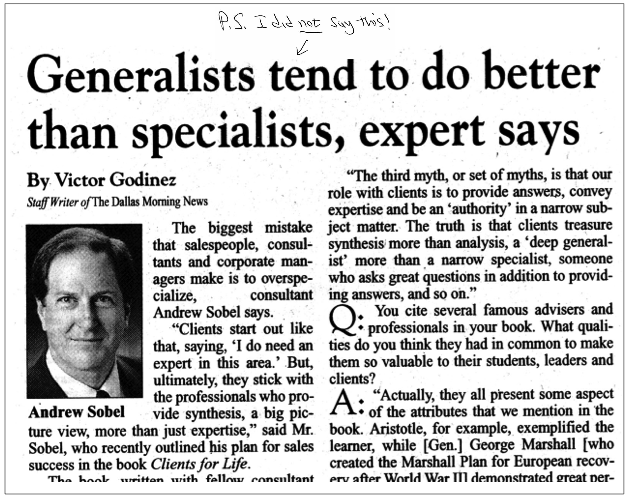 Specialists Do Better Than Generalists. But Deep Generalists Do Even Better. The new wisdom is: Become a visible expert in a niche. If you do you’ll command high fees and be sought after. You’ll get noticed. You’ll out-compete generalists. But even more true is this: Add some breadth to your depth, and then you’ll really shine. I call it the deep generalist. (Actually, someone else suggested that name to me years ago—a famous leadership authority. Find out who it was further down). I nearly wept when I saw it. I did not say—and have never said—that generalists do better than specialists! Ever. David Ogilvy, the advertising genius who founded Ogilvy & Mather, exemplified the expert who, to great profit for himself and his clients, became a deep generalist. Early in his career, he won the prestigious Rolls-Royce account. Instead of holing up in a conference room to brainstorm creative ideas for the ad campaign—as many of his colleagues wanted to do—he launched an in-depth study of the company and its cars. He spent weeks interviewing Rolls-Royce engineers and managers, and pored over every word that had ever been written about the company. In an obscure technical journal he read that the ticking of the dashboard clock is the loudest sound the driver can hear at 60 miles per hour. Ogilvy had found his idea: what to an engineer seemed like a mere statement of fact became for a creative advertiser the basis for an enormously successful and award-winning campaign for Rolls-Royce. Ogilvy took this phrase—“the ticking of the dashboard clock…”—and built a major print advertising program around it, using it as the headline for full-page ads in upper-crust British magazines. Later, other car manufacturers pirated Ogilvy’s idea for their own publicity, and consequently interior quietness has for many years been featured as a key benefit in hundreds of other car ads. Like some other great client advisors such as Peter Drucker, Ogilvy practiced a number of trades—apprentice chef, stove salesman, farmer, and British intelligence agent—before settling in to become one of the greatest advertising geniuses of all time. Who mentioned the concept of the “deep generalist” to me? It was leadership authority and best-selling author Warren Bennis. Bennis virtually invented the leadership book genre in the 1980s. He told me in a conversation, “The professionals who develop into really great client advisors are deep generalists. They develop a unique blend of knowledge depth and knowledge breadth.” He knew something about advisors: He had been president of a leading university, a best-selling author, and counselor to countless CEOs. How would you rate yourself on these two dimensions? Have you built a reputation as an expert in something that clients value? Then, have you added knowledge breadth—about your client’s organizations, about their industries, and about the general business environment they operate in?